Lunagirl Moonbeams by Lunagirl Vintage Images: Happy Leap Day! February 29 was called Leap Day by the Victorians, and the whole year recognized as a Leap Year... Because Leap Day is an "extra" day that doesn't follow the rules, time-honored traditions were turned on their head on Leap Day. For example, you may have heard that women to ask the men for their hand in marriage on February 29. You may not have heard that if the man honored with such a proposal refused it, he would have bad luck for the rest of Leap Year! Leap Year Balls were popular at one time in England and America, often to raise money for worthy causes. At Leap Year Balls, the ladies would ask the men to dance. In English law, February 29 was "leaped over" legally, and no contracts or other legal agreements could be made on that date. 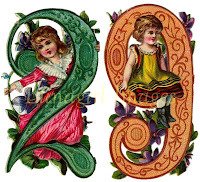 In Greece, the entire Leap Year is considered unlucky for marriages, and in some places February 29 was considered an unlucky date for a birthday. However, many born on February 29 like their unusual special day... and of course they can count a birthday only every four years if they choose (an advantage as you hit those 4-0 s). So why do we even have this weird "tacked on" extra day? Because the Earth's year is actually 365-and-1/4 days long. Instead of trying to count that extra quarter-day, the creators of the Gregorian Calendar (which replaced the old Roman Julian calendar in 1582) decided to add in an extra day every four years. Voila.